In What Countries Do Police Not Carry Guns? In the United States, police and firearms seemingly go hand in hand. When uses of force by police in the U.S. make news, questions often arise as to why and whether or not our officers should carry guns. The carrying of firearms by law enforcement officers is not unique to American policing, though. Many people assume that most European police don't wear guns. The majority of continental police agencies issue firearms to their officers. In fact, the nations in which police do not routinely carry guns are few and far between. There are only a few countries where you won't find officers with handguns on their hips. Though not exhaustive, here's an overview of the few nations where cops don't carry guns. English "Bobbies" - so named for the patron of the modern police force Sir Robert Peel - are famously firearm-free. Their counterparts in two of the other three countries to make up the U.K. aren't gun toters, either. Only the police in Northern Ireland routinely carry guns while on patrol. It isn't to say U.K. officers are defenseless, or even unarmed. They still carry many of the other typical police gadgets - baton, pepper spray and handcuffs, for instance - to help them perform their duties. 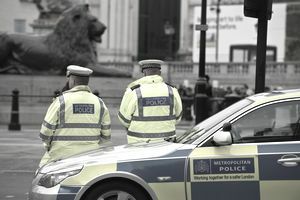 In the event that a situation requires the threat of deadly force, police in Great Britain and Northern Ireland can call on the assistance of Authorized Firearms Officers to respond. These officers have special training in the use of firearms and are ready to respond when the situation calls for it. In Norway, routine patrol officers may keep firearms with them, but you won't' see them on their belt. Rather than carrying guns on their person, Norwegian police maintain their weapons unloaded and sealed in their patrol cars or locked up at a station armory. In the event a situation calls for the use of firearms by the police, officers must get authorization from their chief to deploy them. In the Republic of Ireland, uniformed members of the police force - An Garda Síochána (Guardians of the Peace) - don't carry firearms at all, nor are they authorized to use them. Instead, members of special divisions such as those assigned to counter-terrorism or emergency response units are issued firearms. These officers don't wear regular uniforms, so as not to be confused with regular patrol officers. Icelandic police do not carry firearms with them, and few carry them in their patrol cars. Like many other similarly equipped agencies, special response units are available to use firearms if needed. Unlike in the U.K. and Ireland, all officers are trained to use firearms. In New Zealand, patrol officers don't wear guns on their hips, and most don't carry them in their cars. Dignitary protection units and airport security officers are routinely armed, but the rank and file aren't. Instead, a special Armed Offender Unit is available to respond to incidents which may require the use of firearms. Certain New Zealand police officers - sergeants and other supervisors, K-9 units and criminal investigations units, for example - are authorized to carry weapons in securely locked gun cabinets in their patrol vehicles and distribute them to other police if a potentially threatening situation warrants it and upon the authorization of a commanding officer. Despite the close association with police and firearms around the world, it's not the weapon that makes the officer. Instead, police officers are united by their dedication to protecting the public and providing meaningful service to their communities. No matter how they're armed, police have plenty of tools at their disposal to help them serve and protect. No matter where you are in the world, if you have a desire to help others and protect your community, you may want to consider becoming a police officer.